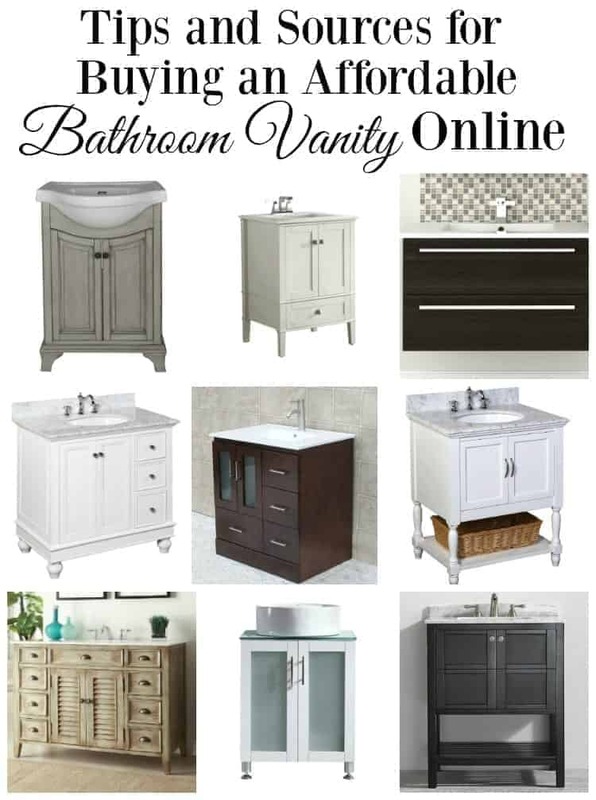 Tips and sources to help you when you’re buying a bathroom vanity online. Now that my small hallway makeover is complete, I’m ready to start on the bathroom. It won’t get a complete makeover just yet but we will be painting the ceiling and walls and installing a new vanity, mirror and sconces. 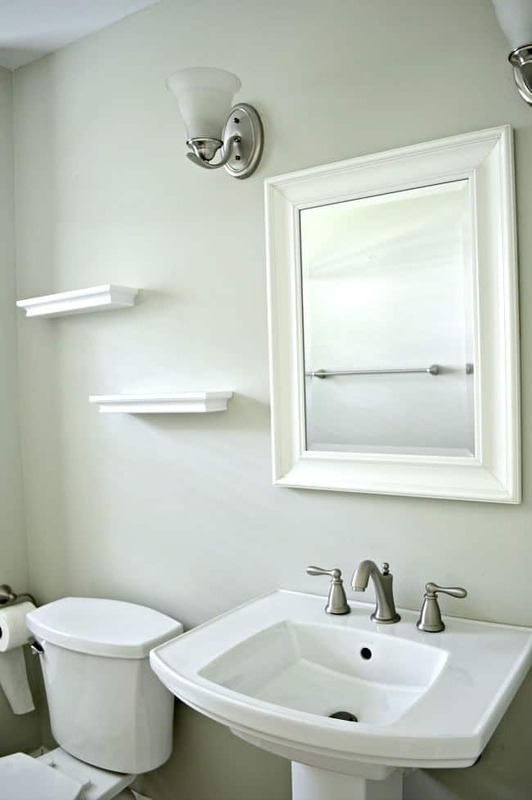 The bathroom (which is our one and only) has a small, shallow pedestal sink that offered no storage and little space to put all of my necessities when trying to get ready, so I knew that it would need to be changed pretty quickly. 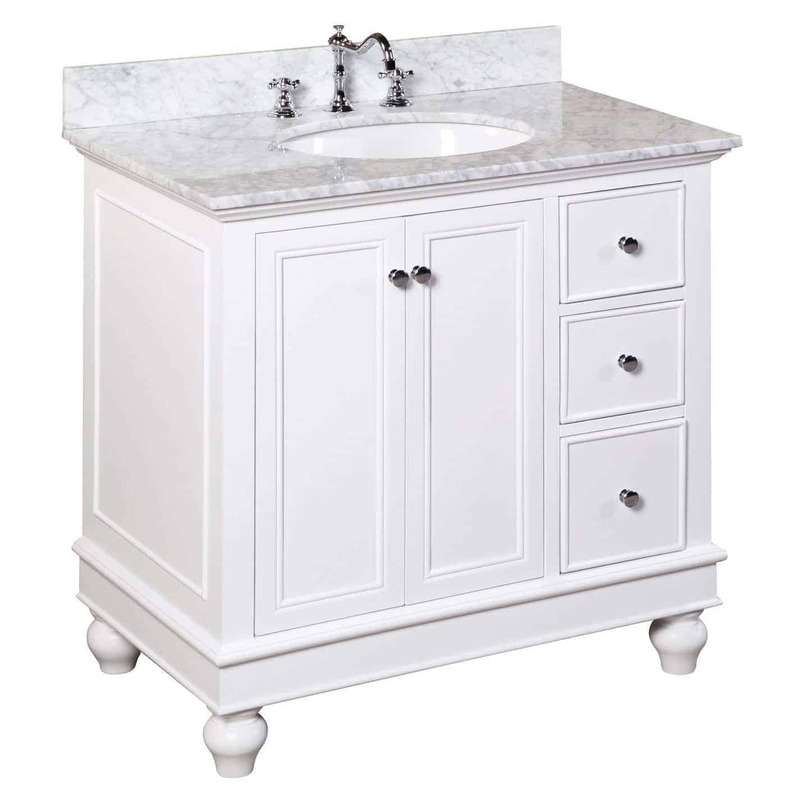 I started my search for a new bathroom vanity before we closed on the house so, by the time we signed the papers, I was able to place my order and have it delivered and ready for us to install. Of course, I started my search by shopping in our local home improvement stores but I just couldn’t find that perfect vanity. 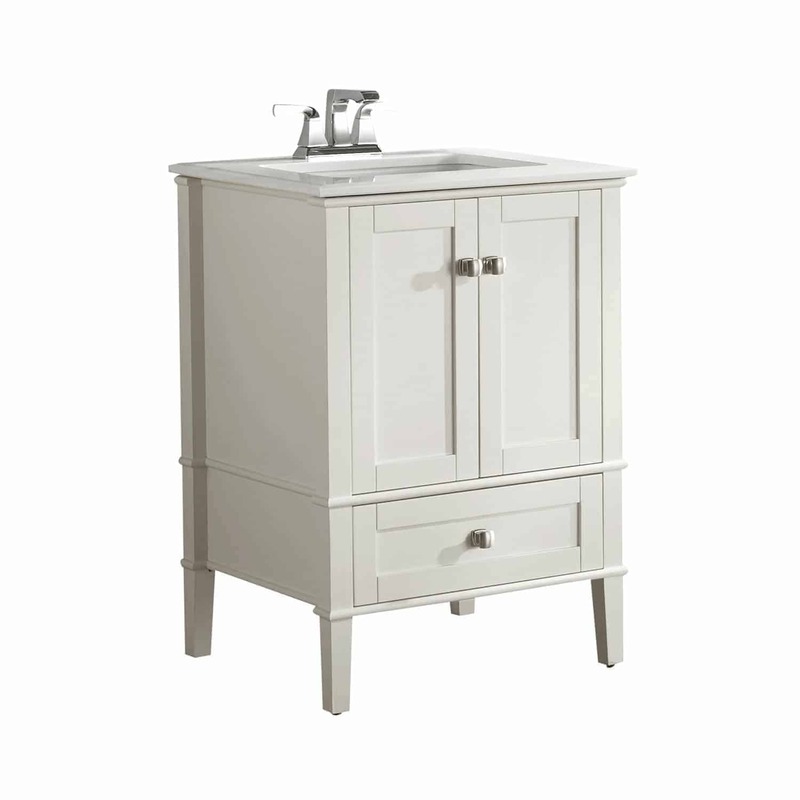 Perfect to me meant painted white, 36″ with drawers and cabinet space and a marble top. I also paid attention to quality and price, looking for a piece that was built with real wood at a reasonable price that didn’t break the bank. 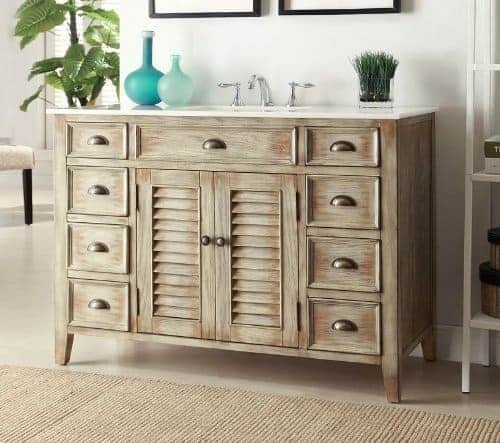 Buying a bathroom vanity online never crossed my mind. I mean…you can’t really see what you’re getting for your money but, when I couldn’t find what I wanted in stores I bit the bullet and began to search online. What I found was surprising. There were tons more online than in the stores and there was every style and price point imaginable available. It was great to find a wide variety but it took me a while to sift through all of the choices, read reviews and find the perfect one. 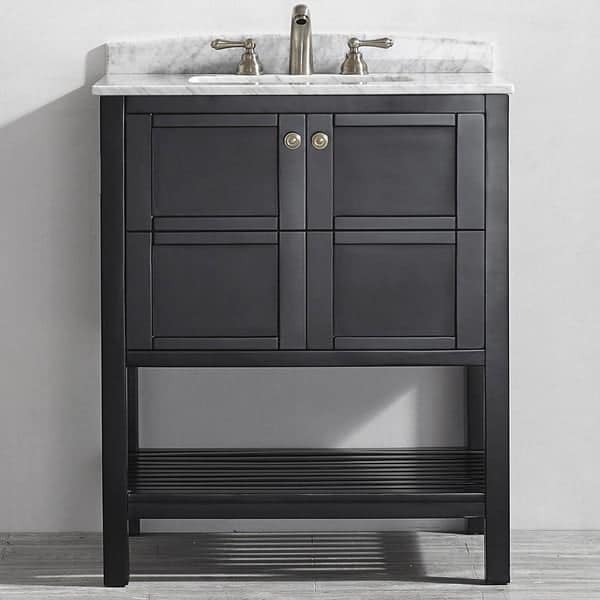 Since I’ve already done all the research, I thought I’d share some of the sources and vanities I found online that were reasonably priced (and by reasonable I mean between $500-$1000), had good reviews and seemed well made. See something you like? Click on the vanity name for more info. As far as shipping goes, I got my vanity shipped for free (yay!!! ), and all but one of my picks have free shipping as well. Also, make sure to carefully check the return policy before you place your order. 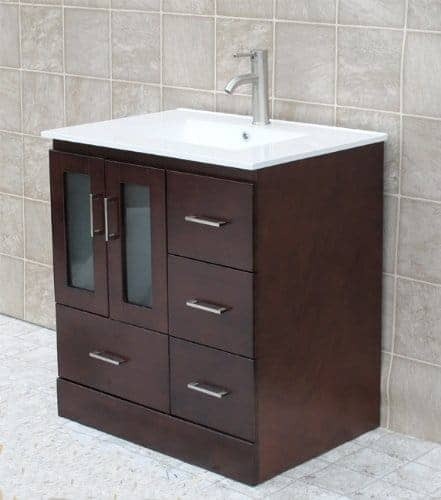 So, if you’re in the market and can’t find what you want in a store, you can definitely buy a bathroom vanity online. Just remember to do your homework and know what you’re buying before you press “BUY”. We are in the process of installing our vanity now, we ran into some issues that set us back. Can you guess which one out of the list? We are going to build mainly because we can’t find what we want that comes without a top…we want concrete and vessel sinks. 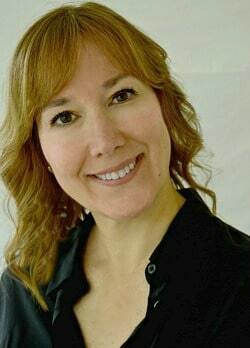 Keep up the fabulous work of making your house into a home. I love following you because you seem to be “one of the girls” ! You live like the rest of us…sensible and on a budget. Good question about the vanity. 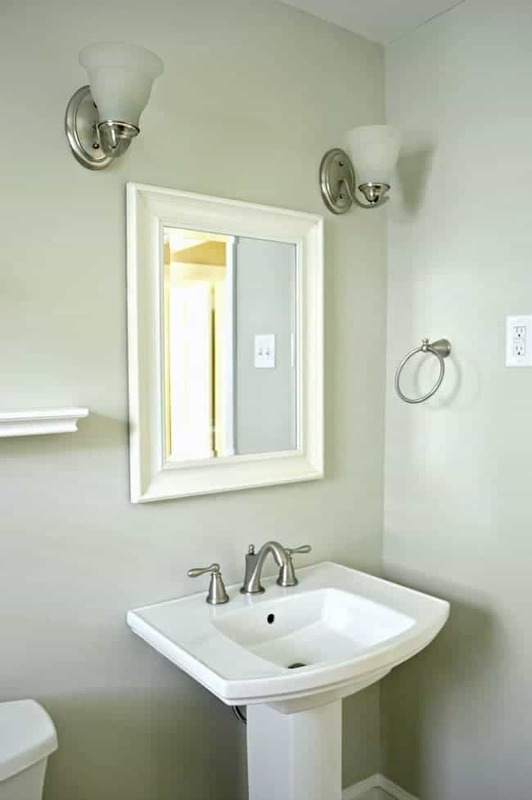 We would normally build something that we needed but with the move, my broken foot, my husband’s new job and putting the new gas lines in (that we did ourselves), something had to give and it ended up being the bathroom vanity. 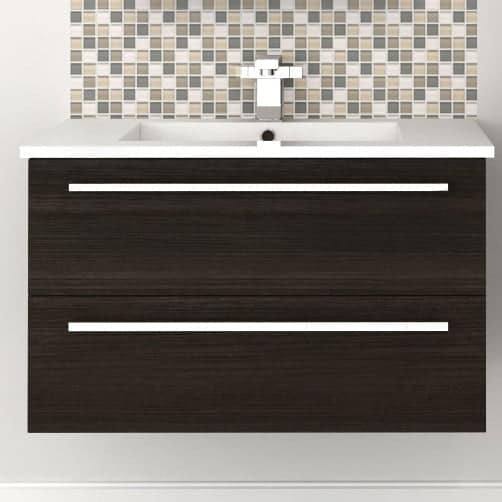 I knew when we moved in that the sink would have to be replaced pretty directly, it had a very shallow basin and no storage, so we reluctantly made the decision to buy something ready made. I am going with the Bella. 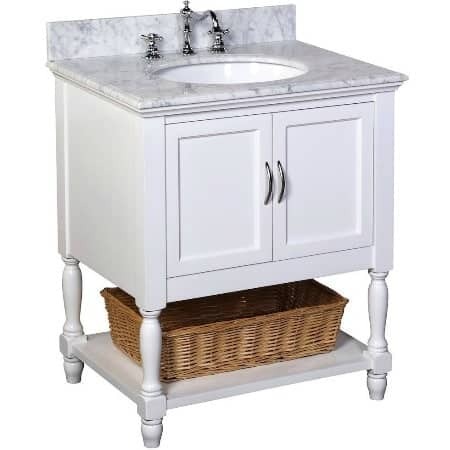 Belle is 36” yet for a marble top I’d say Beverly but the drawers look small to me or the Wayfair which is my favorite although I don’t see the size. I’m dying to see the results. I’ll be happy to have a proper sink again (one that doesn’t shower me with water every time I wash my face). Still working some kinks out, it is a house built in 1946, but I’m excited to share the results. Agree with others, the Bella is the one! Good morning! I really love the Beverly, but the Bella has the drawer space that I would appreciate. I have two vanities and neither have drawers. I’m sure what ever you have chosen is going to look wonderful, isn’t it exciting? 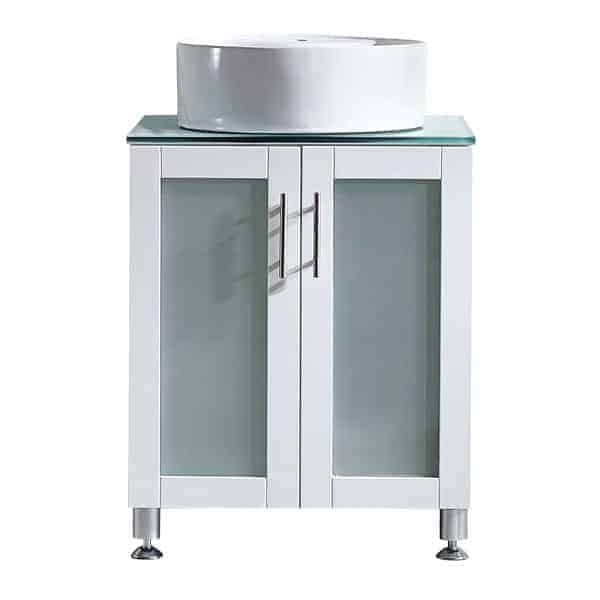 I’d say Bella since it is the 36″ inch, white, marble top you wanted. 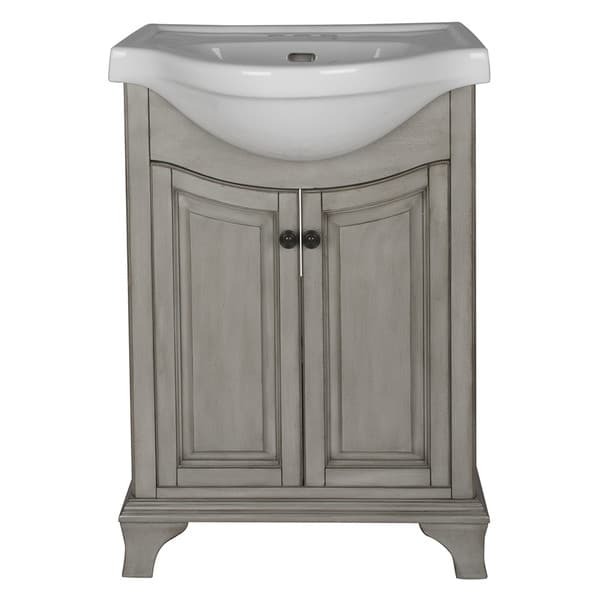 I also liked the Abbeville 46″ but that vanity needs a space big enough not to be squeezed in. The Beverly 30″ is nice as well. I liked the Abbeville, too. I’d just be happy to have a bathroom that would fit a vanity of that size.